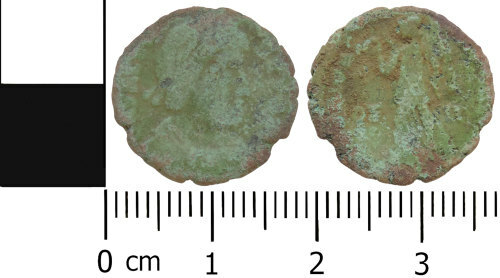 A copper alloy nummus probably of Valens, (AD364-378). Reverse: SECVRITAS REI PVBLICAE; Victory advancing left, holding wreath and palm. In exergue: OF III. Reece period 19. c.f RIC 3b. Obverse description: Diadem, draped and cuirassed bust right. Reverse description: Victory advancing left, holding wreath and palm.